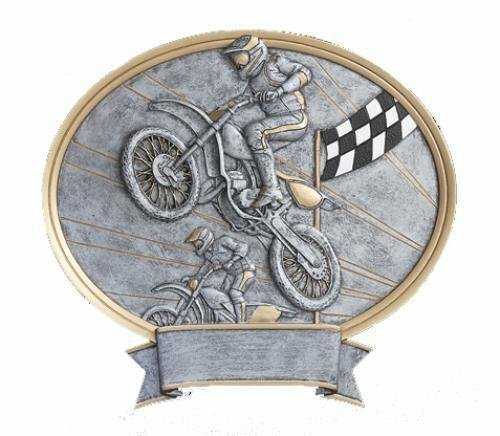 Lots of action is packed into this Legend Motocross Award. Several elements in the award are raised providing a 3-dimensional look. A high flying Motocross rider highlighted in gold tone is depicted while a black and white checkered flag is shown in the background to complete the scene. This item can either be hung on a wall or placed on a desk using the included stand. These Legend Racing Awards are sure to be a hit. The racing icons in the award are raised providing a 3-dimensional look. A pair of crossed checkered flags are depicted. This item can either be hung on a wall or placed on a desk using the included stand. 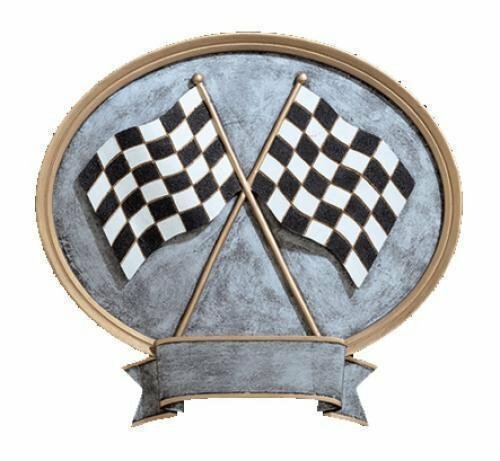 An Action 3D Pewter and Gold Sport Scene with Racing Crossed Flags on Bronze Base with room for an Engraving Plate.